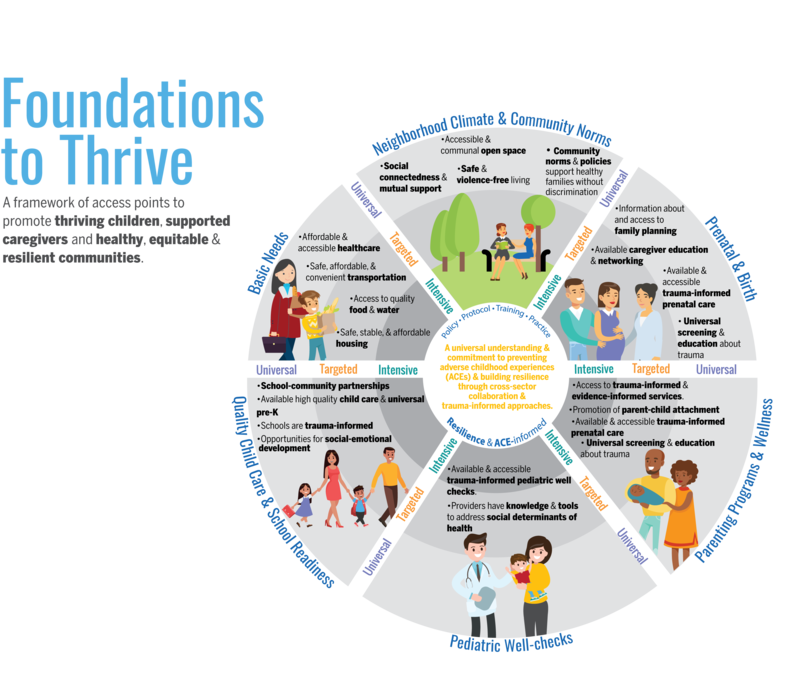 Home » Reports » “Foundations to Thrive” a new framework to identify optimal conditions to promote resilience in Travis County. A growing body of research has found that prolonged exposure to trauma and adverse childhood experiences (ACEs) can alter the brain development of children and lead to poor health and social outcomes later in life. Thus, universal prevention of children’s exposure to significant adversity should be a top priority in all communities. In addition to this, screening for and addressing trauma that has already occurred through various multi-level, cross-sector approaches is critical to the creation of healthy, resilient communities where children and families can thrive. 2) Promote resilience through trauma-informed efforts for children and families who are at risk for, or have experienced, trauma. The first step in understanding the assets supporting optimal child development and promoting resilience was the creation of a guiding framework for understanding multi-sector impacts on young children and families in Travis County. The comprehensive framework brought together areas of potential impact for families with young children, including Basic Needs, Neighborhood Climate & Community Norms, Prenatal Care and Birth, Parenting Programs and Wellness, Pediatric Well-checks, and Quality Child Care and School Readiness. We also explored the availability of universal, secondary and targeted approaches. 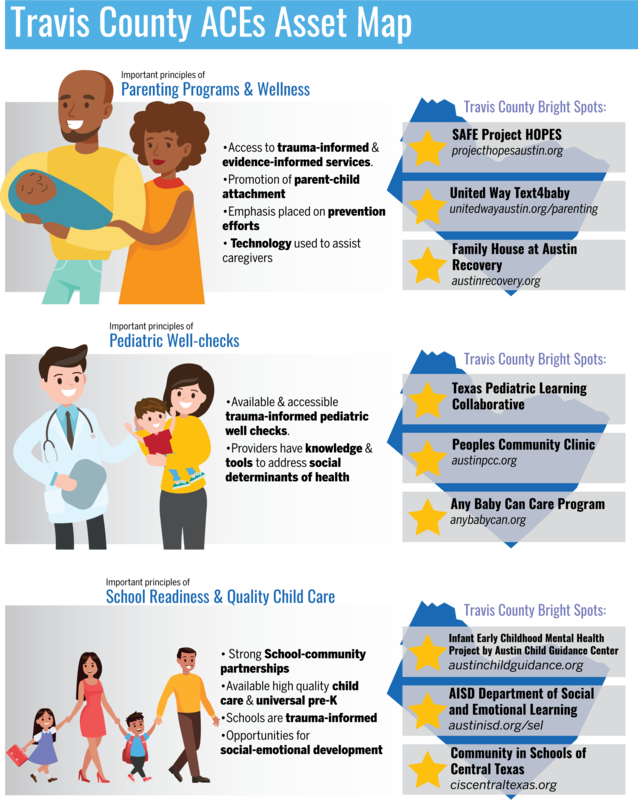 Through exploring these areas, the goal of the asset map is to highlight services and resources in Travis County already supporting young children and their families. By focusing on existing strengths, the intention is to frame the conversation towards innovative linkages in resources, building on current support, and developing community-based strategies to promote well-being moving forward. Through this process, gaps, overlapping services and community challenges were also identified but are discussed in relationship to infrastructure already in place in order to expand efforts currently underway in Travis County. 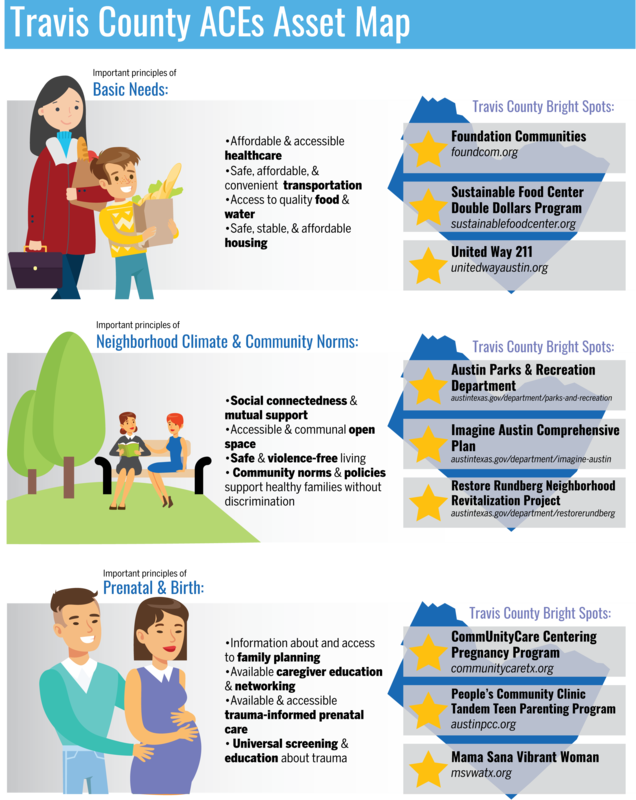 The following graphic provides an example of some of the “bright spots” happening in Travis County. While there are many programs and approaches benefitting children and families in our community across sectors, these are a few we chose to highlight. The Asset Map report for Spring 2018 is now available and can be utilized by funders, program developers, policy makers and community stakeholders to explore strategic next steps for ensuring Travis County supports opportunities for all young children and their families to thrive. The Asset Map itself is considered a “working document” and will serve as a starting point for continued conversations within our community. We anticipate that the Asset Map will benefit from additions and revisions as community input and new programming continue. See the full report below.